Imagine to go back in the time, 3300 years ago, about the year 1300 BC (9000 months – not 9000 years!!! - before Solon, from whose narration Plato philosopher drew his information about the lost land of Atlantis). At that time, the sea today known as the Mediterranean Sea had to be divided in two parts, placed at different levels and deprived of mutual communications. The western Mediterranean and the Tyrrhenian were - as they are today - in communication with the Ocean, through Gibraltar, opened more than thousand years before. The eastern part – i.e. 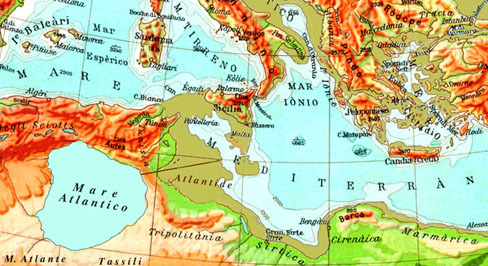 the Greeks’ Mediterranean – was properly an “interior sea”, like a lake, from the Small Syrte to the Syro-Palestinian coasts, including lower Adriatic and Candia Sea (while the Aegean territory, all emerging, was a plain, crowned by volcanic mountains). Its waters would be approximately 300 m under the level of today. We will note this level as “level zero”, in order to measure the relative altitudes. The Channel of Sicily (as today we know it) was at that time a fertile plain, watered from rivers and protected by high mountains. At the extreme west of the eastern Mediterranean, not far away from the island of Malta, two tightened mouths opened to a great gulf, deep more than thousand meters. Around that gulf, protected at its mouths by a great island, a flourishing civilization was risen from Libyan people, that where perhaps had come down by te highlands of the south. Who had come by east, from Crete or from Egypt, would see a rocky, steep coast, in which two straits opened, at the sides of a wide island, approximately 150 m high. The two streats, north and the west of the island, measured 15 - 30 km. We can identify in this system the “Heracles’ columns” of the ancient mythology (one of the two “columns” appears identifiable with the island of Malta). Toward north-west, beside the great gulf, a high peak (more than 1100 m from the waters of the lower sea), that today we know as Pantelleria island. The western sea, connected from many centuries with the waters of the Ocean through the mouth of Gibraltar, was near to overflow and to spread towards the gulf and the eastern Mediterranean, placed at a lower level. This was a true hanging curse for the people (Atlantoi-Tjehenu) that inhabited those lands, but they were convinced that geographical asset could last, as they had always known. To the west of the “port” or gulf it spread a width, fertile plain, which perfectly corresponds, in physical and climatic features, to the territory described by Plato. The philosopher narrates the inhabitants of Atlantis grew - between others - dates and bananas, and in the fauna detaches the presence of elephants. The distance from the gulf, towards south, until to the sides of the western Mediterranean, is 540 km, and the one from the coast of the gulf until the reliefs, that delimited an inner sea, 360 km. On the volcanic hills, there were the mines and, approximately 450 km from the waters of the Mediterranean, spread an enormous water basin: like a sea, whose surface was at the level of 650 m upon the Mediterranean. That sea collected the waters of an immense rain basin, whose extent, south, arrived until the Tassili and the Ahaggar (Hoggar, “Atlas” mountain, according with Herodote). Its waters, at the time, fed an emissary who came down towards east, to the Mediterranean: a perennial river watered lands of the immense plain. The bottom of that basin is today a great sand sediment, the eastern Grand Erg (Igharghar): one of bigger sand deserts in the world. Two main tracks lead from the Mediterranean shores towards mountains of Ahaggar. The first one runs along the west shore of the ancient upper Sea, the other one along its eastern shore. This is the great “carts road”, cause of its rock paintings and graffiti, representing scenes of life of the second millenary b.C., with hunting men, herders, cart drivers. In that region a pre-Libyan people founded an empire. They were great constructors and great navigators and knew writing, with an alphabeth presumablly similar to the Libyan-Berber one; they were were called “Tjehenu” by the Egyptians and were the Atlantói of Plato’s Dialogues. That people could have reached the coasts of the Mediterranean from the great mountains of the South, called “Atlas” by Herodote. At least from 3000 b.C. Atlantói were able to construct fortresses with great stone-blocks and lived in a constant confrontation with the empire of the Pharaohs: it was the so-called “war of the bronze”. Between the products of vital importance for the spread of the technology, they had the important monopoly of obsidian, a stone (volcanic glass) very important for the production of blades and other objects. Mines of native copper (oréi-chalkos) were on the hills of Atlantis, but the great technological innovation was the use of the bronze, an alloy of copper and tin, with better hardness and resistance. The strategic objective in order to obtain the monopoly of the bronze was the control of the mines of tin, of which Africa is lacking. The Pharaohs supported for this the long war against the Hittites and conquered the control of the mines of Anatolia. The tin of Atlantói came from the south-west of Iberian peninsula, and perhaps from Cornwalls. The net of their relationship trades could have been connected with the spread of the “megalithic cultures” in Europe and in the western Mediterranean. All that world would ended in the space of 24 hours, in a day of a year between 1235 and 1220 b.C.. A violent series of earthquakes seriously cracked the rocky dams that contained the waters of the upper Saharian sea and of the western Mediterranean. The upper waters caused gigantic waves of flood. Also calculating for defect the volume of the inner and upper sea, it would have contained at least 50,000 kilometers cubes of water (50 x 109 m3). The wave could have an equivalent energy of 17,5 x 1015 kgm = 17 x 1016 Joule. The enormous cascade hit with a direct impact the island and the capital city of Atlantis, situated approximately 600 km before the natural dam. Still today, if you watches with attention on a geographic map or on a satellitar photo, you can see, on the region of eastern Grand Erg, of the Gulf of Gabès and of the Small Sirte, the marks of this ancient catastrophe. The Gulf of Gabès appears as a “funnel” and it is not difficult to imagine the enormous water mass running throughout it. The cataclysm appears complete if we imagine that the same series of earthquakes provoked the yielding of the diaphragm that it connected Italy to the Sicily, with the consequent opening of the strait of Messina. The sudden start of the current dug furrows deep. The harbours in the area of eastern Mediterranean were submerged. Mud and currents turned hard to navigate in the Small Syrte and in the Channel of Sicily, as was reported by Plato and other classic authors (included the narrations of the myth of the Argonauts). If what we have exposed is credible, Atlantis has never moved, it is not sinked in oceanic abyss. It has been upset by enormous waves, its ruins have been covered by tens of meters of mud and sand and then by some hundred meters of water. The destruction of the economic and cultural center of Atlantis can appear connected to the “mysterious” interruption of the megalithic culture, in the area of the western Mediterranean: Iberian peninsula, Sardinia and Corsica and - we could add - until the British islands. An important pole of reference desappeared, a country of great navigators, who were used to trade with the western countries in order to import the tin, essential to fuse the bronze, and in exchange they exported Mediterranean obsidian and other products and foods. It could be tried to find the different submerged coastal levels, correspondent to the progression of waters, from the moment of the catastrophe of Atlantis until the complete filling of the eastern Mediterranean sea to the oceanic level. An important confirmation, relative to ancient levels, could come from the search in depth of Crete of the ancient Minoic ports. - The disappearance of the megalithes constructors, in all the area of the western Mediterranean. The local population had fallen back in a regimen of poverty and alimentary subsistence, than they did not be allowed to build great works. - The successive occupations of the great islands (Sardinia and Corsica) from part of the sea-people made more and more to sink in the mystery the origins of that “people of the megalithes” that had preceded them. - Perhaps a small group of survivors of the Tjehenu people conserved the memory of a part of ancient myths. Mythical Queen Tin Hinan, buried in the mountains of the Ahaggar, in the heart of the Sahara, can be a trace, at least in the permanence of the name, as the alphabet tifinagh, used in the most ancient Libyan-Berber languages. We must be grateful to the attention of Plato if the report of Solon on Atlantis went on to us: a memory that could disappear, buried in the oblivion, like many other forgotten events in the course of the history of the mankind. This is an abstract of the Italian book: Atlantide. Un mondo scomparso, un’ipotesi per ritrovarlo, ed. Liutprand, Pavia, 2001. The author, Alberto Arecchi, is an italian architect, and lives in Pavia (Italy). He worked for some 15 years in different countries of Africa, operating from 1975 to 1989 as an expert of the international cooperation for the development. Alberto Arecchi is the president of the cultural Association Liutprand. His main professional interests are: restoration of historical architectures, bio-architecture, constructions with appropriated technologies, city planning, projects for development with strong popular participation.